Upon entering Poland, ME, we first noticed Shaker Village, a picturesque working town surrounded by rolling hills. A few minutes later, we drove into Elan's driveway. At first glance (on a very dreary day), the school looked less than inviting; a trailer type building showcased the administration building and the grounds looked a little barren (this due to mud season) waiting for life to begin. This is where the dreariness ended. We were met in Portsmouth, NH, by Elan's driver, a woman named Teresa. Teresa was a lovely, upbeat, dedicated employee of Elan who educated us for the hour and a half ride. Her cheeriness and commitment to the students was our first clue that Elan would be a solid program. A no-nonsense approach to learning both in the classroom and socially is what both students and staff on every level conveyed to us. The system at Elan deals with reward based on a military style pyramid. Students are all playing on an equal field starting out with various problems including substance abuse, family and social issues, academic failure, truancy, promiscuity and other defiant behavioral issues. Good behavior is rewarded by being given more responsibility in the two main houses. Poor behavior means demotion back down to the bottom of the pyramid. This school is run by the theory that each student is to be respectful of the others. In other words, when a situation comes up, student input is weighed heavily in determining discipline, therapy and consequences given to their peers. Recommendations for group session topics are also suggested by the students and reviewed by the staff. To our amazement, some of the students we spoke to privately had been in other programs, were 18 or older and had chosen to stay at Elan until completion of school and graduation. This in itself is a remarkable feat. We believe students recognize the dedication of staff and teachers to their cause. We love to see a strong academic component with solid courses a "real education". Elan has it. Each student who was closing in on graduation was going off to colleges in various locations across the country including "name schools". When asked, the students spoke quite highly of all of the different facets of their lives in Maine. The program is meant to be co-educational and takes students from age 13. On our particular visit the youngest students there happen to be 16. Elan is not a clinical program nor do they pretend to be. Don't look for the Ritz here. The accommodations are cramped but spotless maintained by the worker bees (lowest on the pyramid). There is little TV or movie watching and only homework or college search can be done in the computer labs. Meal times are done in each house and run by top level students. Elan has a five-week rotating menu which is approved by a certified dietician to ensure that students receive proper nutrition. The food looked edible but again it's not a five star menu. Quite simply Elan is down home Maine. The bonds with teachers, staff and each other are what drives and motivates these kids to become caring, responsible adults. 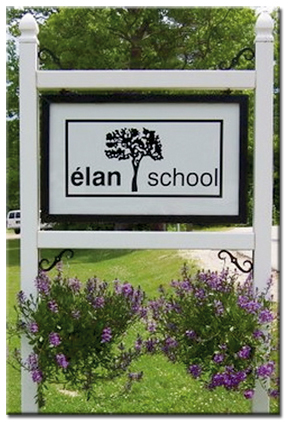 The foundation given at Elan should catapult each student into college, work or back to family successfully.